From Kotobukiya! Once a normal ape living in Africa, Grodd (along with his people) was given heightened intelligence by the pilot of a crashed alien starship. Unlike the other inhabitants of Gorilla City, however, Grodd also received incredible telekinetic and telepathic powers! In the New 52 era of DC Comics Grodd was ruler of Gorilla City, and that version of the character is now immortalized in the elite ARTFX+ series with this massive and mean presentation of Gorilla Grodd standing on two legs and bellowing into the air with the skull of one of his victims held aloft! 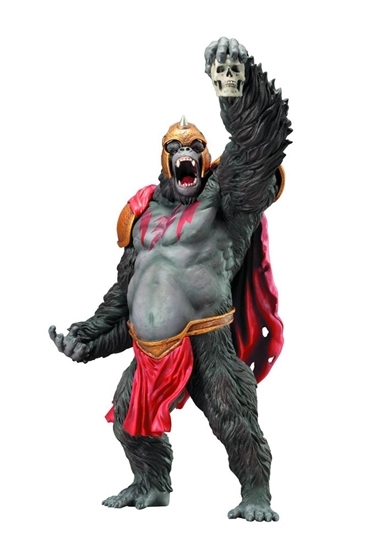 Sculpted by Ikkei Jitsukata, Gorilla Grodd stands an incredible 10 inches tall in the ARTFX+ 1/10-scale, and the magnets in his feet provide extra stability on his included display base.